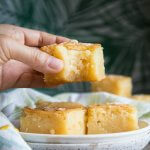 Hawaiian Butter Mochi is a buttery and chewy coconut dessert made with glutinous rice flour. It is a very popular treat in Hawaii that needs to make its way over to the mainland. Once you have a bite, you won’t be able to resist another. I think by now I probably sound like a broken record saying how much I love all thing Hawaiian. Well, I suppose food speaks even louder than words, because today we’re talking Hawaiian Butter Mochi. 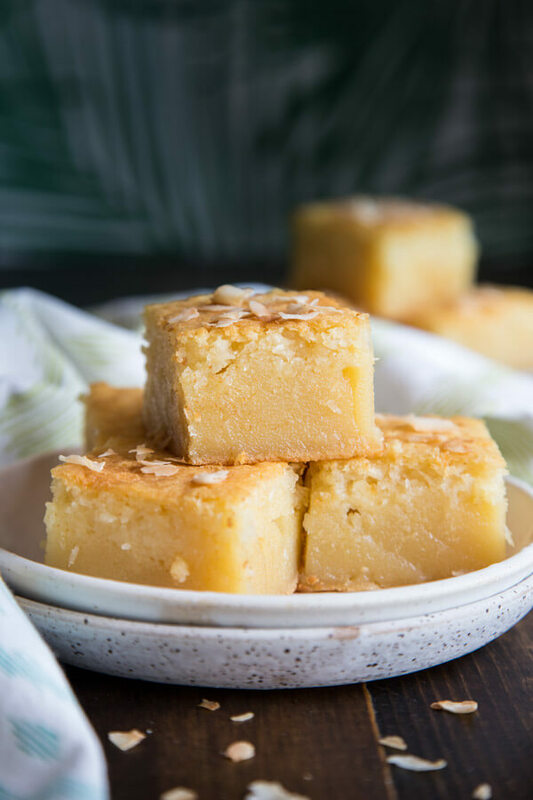 This is a slightly different, bigger and richer version of the Coconut Mochi that I make every year. A few months ago, Ryan took a trip out to Oahu to visit me while I was there for work. He happened across the last piece of butter mochi at Leonard’s and was hooked ever since. So of course, when I got home, the request was in for me to recreate that delicious Hawaiian butter mochi. This version is not quite as buttery as the one we had on Oahu, but it is still absolutely out of this world delicious. Ryan and I had a debate on whether this was better or the one at Leonard’s. I think this one is. You could certainly help us settle our scores by trying the recipe out yourself. Mochi is made using Mochiko or sweet rice flour, which is the same as glutinous rice flour. This type of rice has shorter grain and very sticky when cooked. You need to purchase the correct type of rice flour for this recipe to work. You should be able to find this at any Asian grocery store. I actually bought mine at a Stater Bros across from my house, though I don’t know if all Stater Bros carries it. 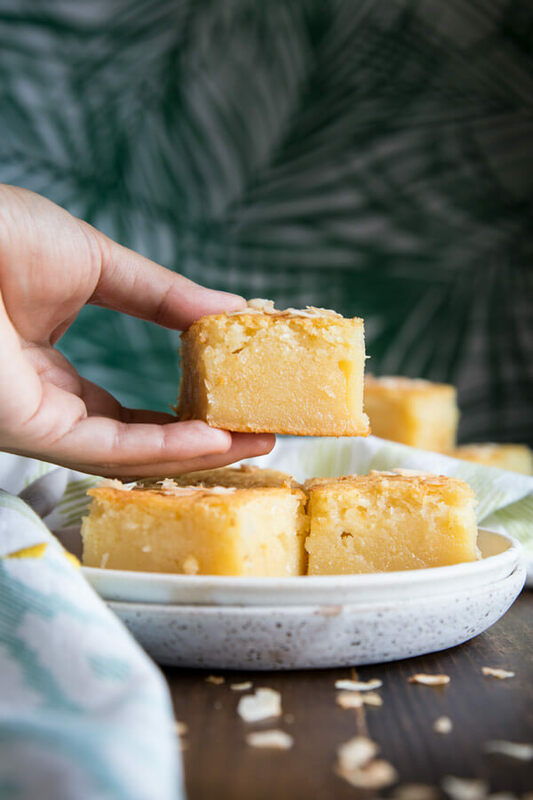 For this Hawaiian Butter Mochi, I used coconut cream for a richer taste. You can substitute coconut milk if you can’t find coconut cream; the end results will still be very delicious but slightly less rich. Mix the batter thoroughly until completely smooth. 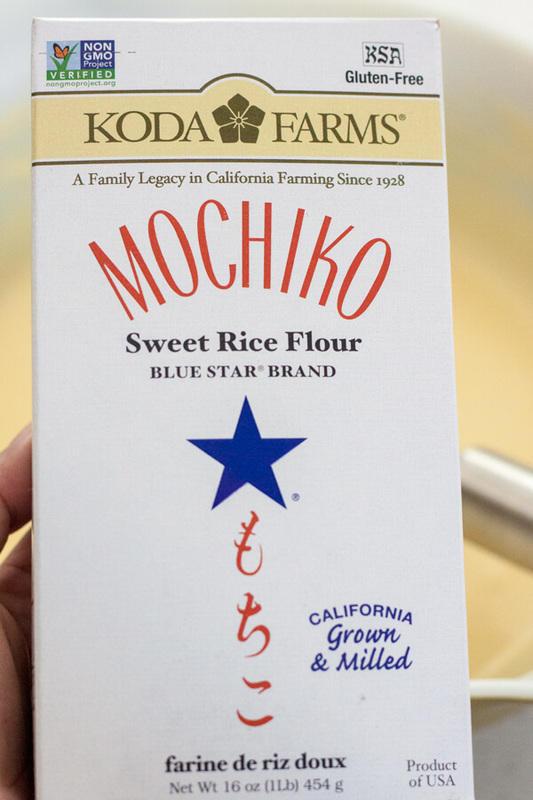 You don’t have to worry about overmixing and gluten formation since rice flour is naturally gluten free. If you’d rather have a smooth batter, you can skip this step. But I love coconut of all sizes, shapes, and forms, so this is a must for me. 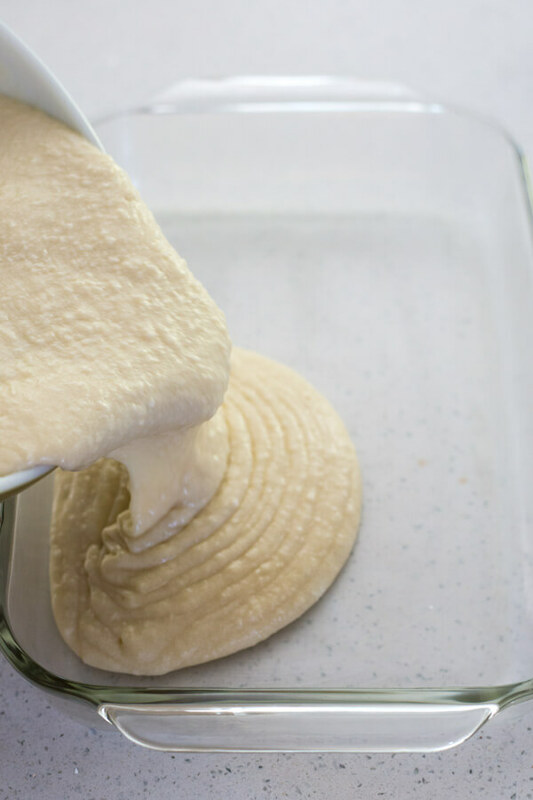 Just fold it in the batter using a spatula until evenly distributed. This time you don’t have to make sure the batter is completely smooth since the coconut shreds will just be a mix-in. 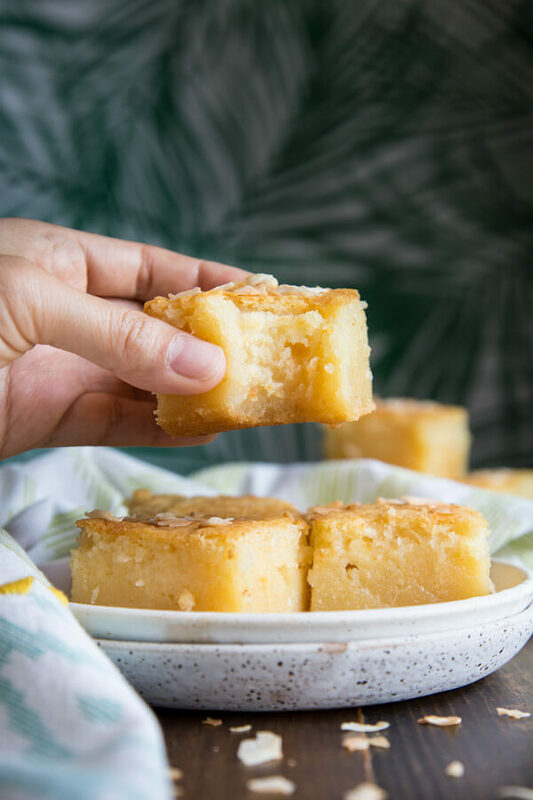 This Hawaiian Butter Mochi is a true one bowl recipe. You don’t need any fancy equipment to make it, just a mixing bowl, a hand whisk and a spatula. But you can definitely use your stand mixer if your mixing bowl is big enough. A batch makes plenty, enough for a pot luck or to share with everyone in your office. Store them in the fridge, and reheat in the microwave for 15 – 30 seconds depending on how big a piece you cut. Be sure to wrap them in damp paper towel when reheating so they stay tender and moist. Butter a 9”x13” baking pan. Add melted butter and sugar to a large mixing bowl (or the stand mixer bowl) and mix well to combine. Add vanilla, eggs, evaporated milk, coconut cream and beat until smooth. 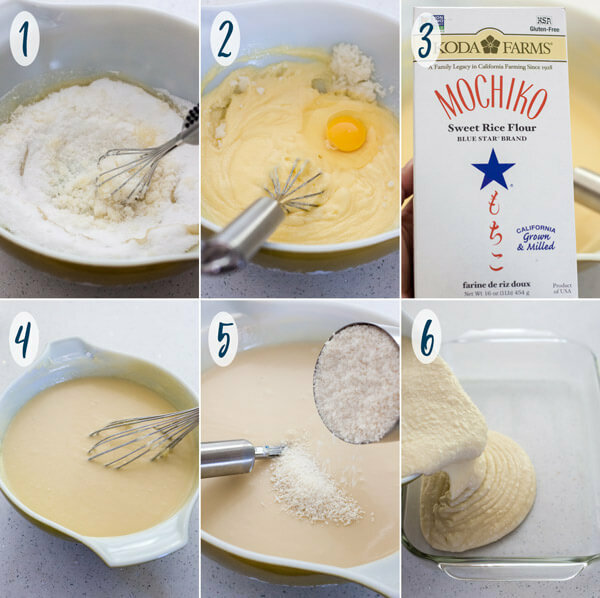 Stir in mochiko and baking powder and mix until completely smooth. Pour the mixture into the prepared pan and bake for 55 -75 minutes until the top is golden brown and a toothpick inserted in the middle comes out mostly clean with just a few crumbs attached. Sprinkle coconut flakes over the top if desired. The reason for a wide range of baking time is varying oven temperature. I've made this recipe multiple times and each time the baking time vary slightly. Check the doneness at 50 - 55 minutes and continue to bake as needed. Refrigerate left over. To reheat, wrap a piece of mochi in a damp paper towel and microwave for 15-30 seconds depending on the size you cut them. You can use coconut milk instead of coconut cream; the mochi will be less rich but no less tasty. Coconut milk is thinner than coconut cream and will most likely require a longer baking time. 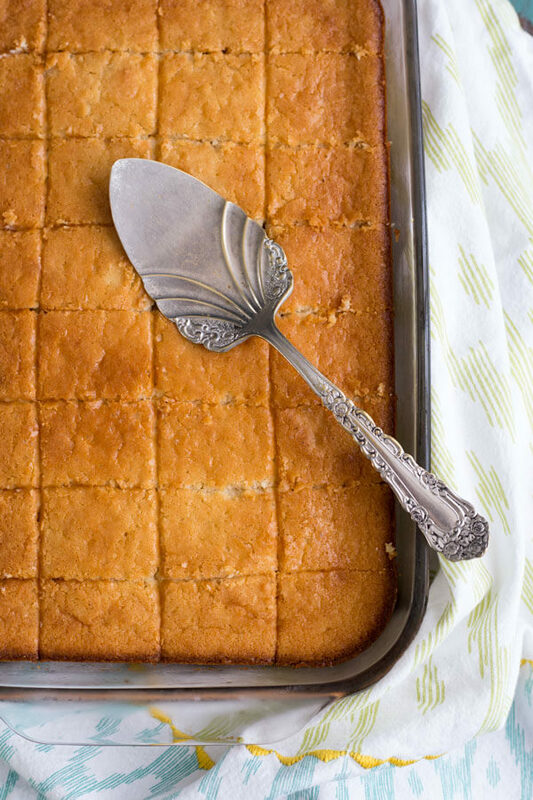 This recipe is adapted from Hawaiian Culture Stories and Contemplating Sweets. Is it possible to use regular 2% or whole milk instead of Evaporated milk? Hey Stephanie, you can substitute but note that whole milk has higher water content than evaporated milk and 2% has higher water content than whole milk so the taste will be less “rich” and the baking time may lengthen. 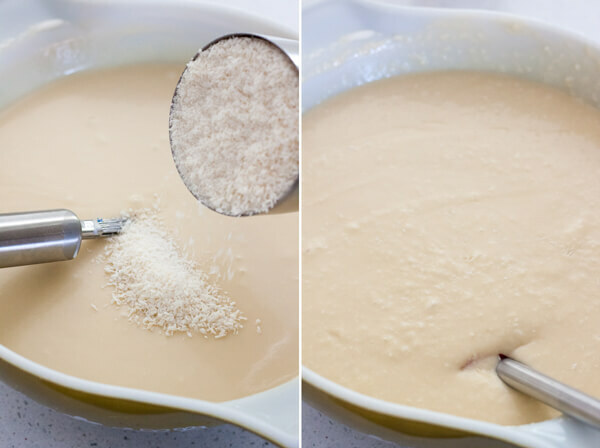 If you’re looking for a substitution because you don’t have evaporated milk, use 3/4 whole milk and 1/4 cream. But if you’re looking to use a less “fat” milk, then I would try to keep it at whole milk, 2% is too light IMO. I made your butter mochi for family and friends for Chinese New Year, and can’t remember the last time I got so many raves and requests for more (and I bake A LOT)! Even people who 1) don’t love coconut, 2) don’t have a huge sweet tooth couldn’t stop telling me how much they liked it. I cut the sugar down by just a tiny bit (maybe 1/4 cup or less) which didn’t seem to affect the taste. Also, in my oven, 55 minutes was a bit too long (top got a bit too brown) so will cut back a bit next time. 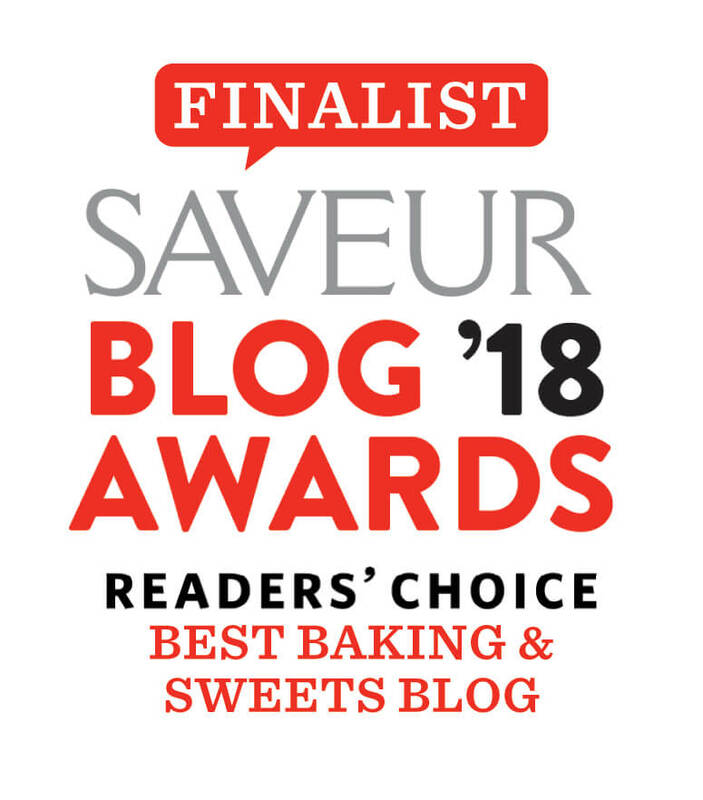 Thank you for this amazing recipe…I haven’t found another on the Internet that uses coconut cream and think this is what puts this recipe over the top! I’m so happy you and your boys enjoy this. I really appreciate your feedback and thanks for baking along! Hello! Im look8ng forward to making this. One question, how big a box of mochiko? Hi Gabriel, I usually buy a 1 lb box, pictured in the post, this is enough for 1 batch. I made this recipe for the first time today. I baked in convection oven at 325 and after 60 minutes took out. I probably could have taken out after 50 to 55. The top was a little browner than I remember when I was in Hawaii. Still very tasty and something I will make again. This is a delicious recipe. Everyone absolutely loved it! Will be making this again and again! Thank you so much. 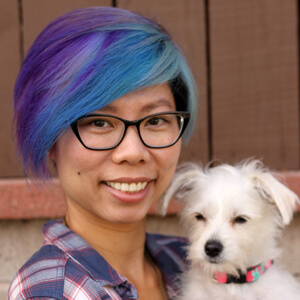 Hi Trang! 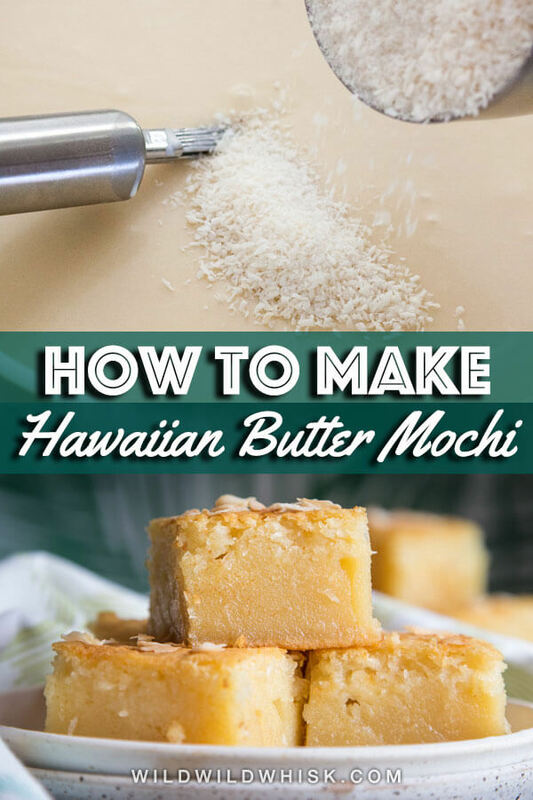 So excited… Can’t wait to try this mochi recipe! For the cans of milk and coconut cream, how many oz are each can? I found different can sizes at the store. Hi Elle, the evaporated milk is 12 oz and coconut cream is 13.5 oz. Apology, I didn’t think about the different size cans. I’m going to update the recipe card. Thank you for your question 🙂 I hope you’ll enjoy these!